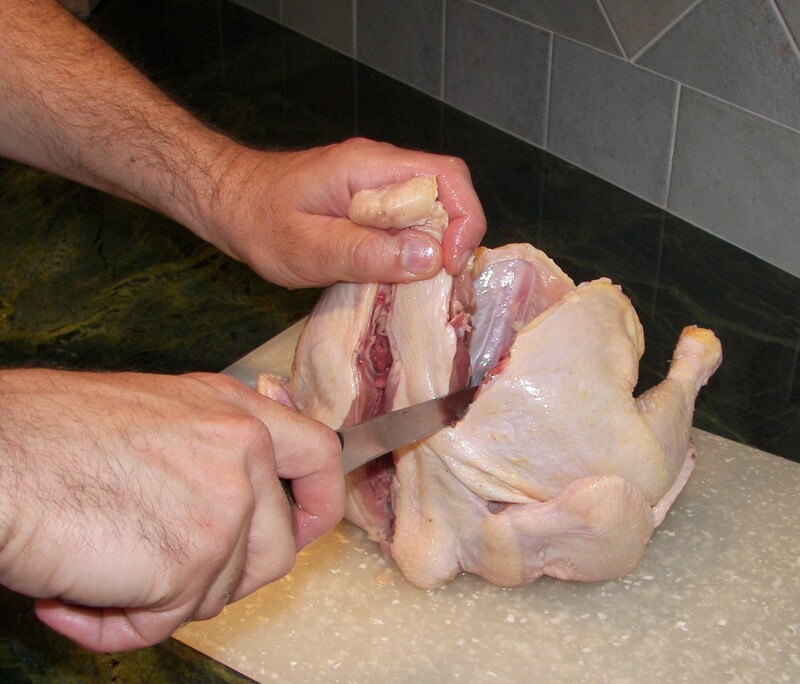 Remove the Chicken from the package along with any Giblets that may have been tucked inside the cavity (Either discard giblets or save them for another use). Rinse the bird thoroughly and pat dry with paper towels. Begin by removing the wish bone (Sorry Kids, I know it’s fun to make a wish, but removing the wishbone before cooking the chicken will make carving easier when the bird is done). Spread the skin by the neck opening apart with your fingers. Locate the wishbone by pressing lightly on the breast meat surrounding the neck opening. The wishbone will feel like an upside down “V” buried just beneath the surface. Run the point of a boning knife along the inside and outside edges of the wishbone. Make sure the knife penetrates only slightly deeper than the bone itself. The next step is to free the top of the wishbone. Insert the knife tip on top of the wishbone. The top is the point where both sides of the bone come together. 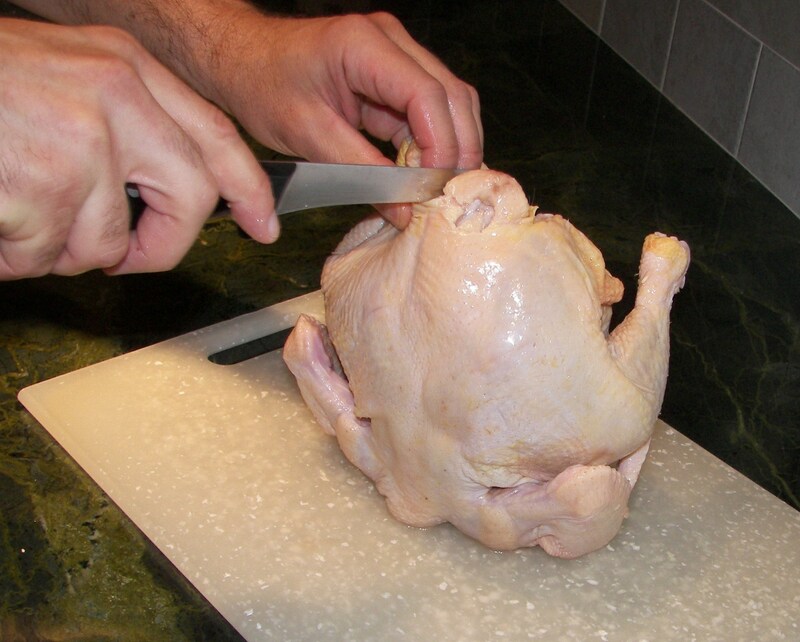 Gently push the knife into the chicken on a slight downward angle. The knife tip should severe the top of the wishbone from the rest of the skeletal structure. Insert your pointer finger into the inner “V” and run it along the back of the entire wishbone. Then pull the top of the bone forward like you were throwing a switch. This should free most of the wishbone. Snap off the remaining bottom connections. Remove and discard the wishbone. Position the bird so the legs are pointing up and the back of the bird is facing toward you. 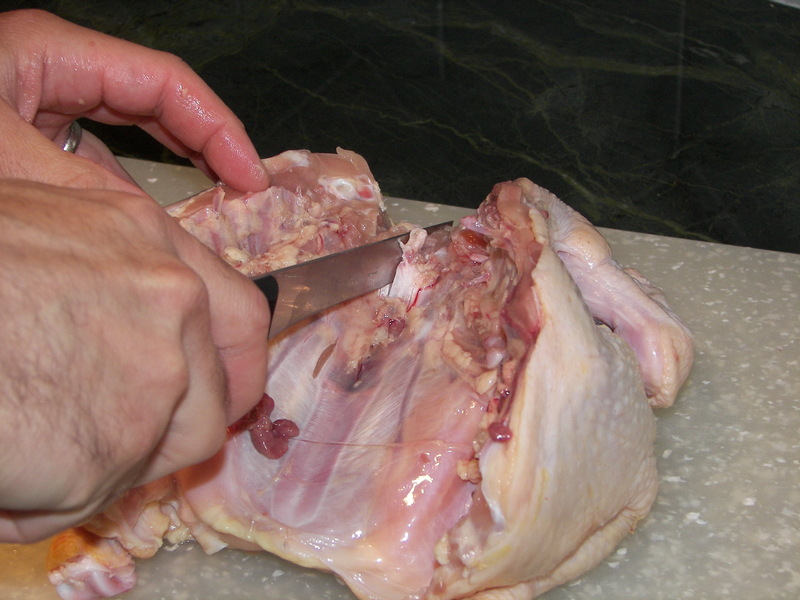 Use a sturdy boning knife to cut along each side of the backbone in a downward motion. Make sure you cut completely through bone structure connecting the backbone to the rest of the skeletal system. Discard the backbone or save it for making stock. The next step is to remove the Sternum bone. It runs down the middle of the bird and looks similar to a little spoon. The bowl of the spoon will be hard bone material. The handle will appear as if it made from a white rubbery substance. 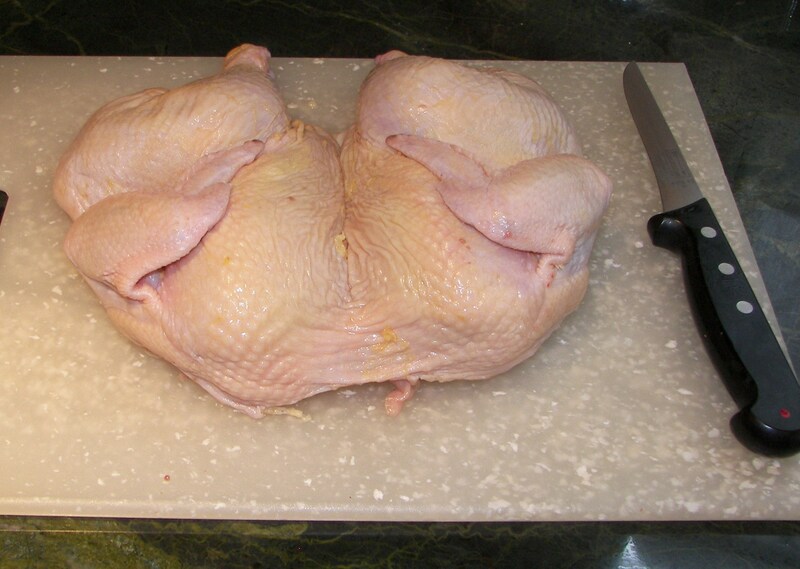 Lay the Chicken on a flat cutting surface with the breast facing down and the open cavity facing up. Make a shallow cut down the middle of the neck cavity until the blade touches the sternum bone. The blade should just nick the top of the Sternum bone. Do not cut too deep. Spread the cavity of the bird open with one hand. Push up with the other hand from directly below the sternum bone. 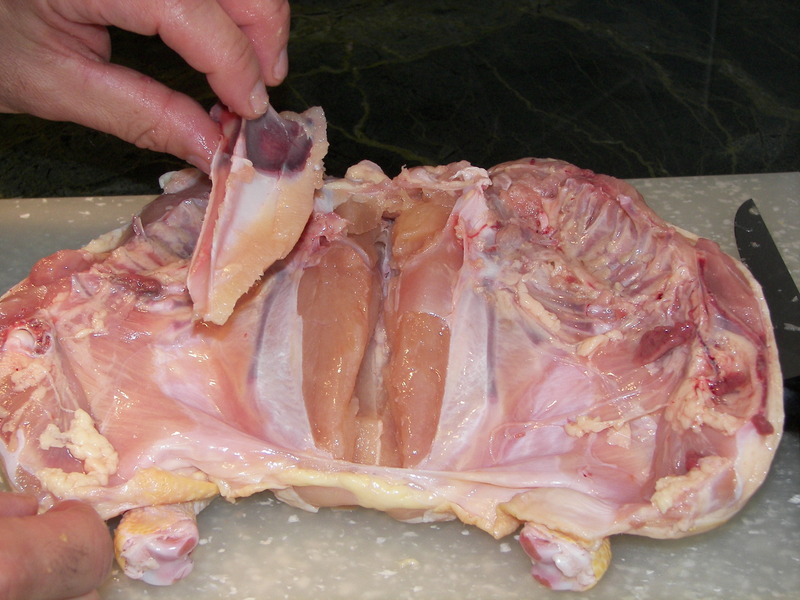 This should cause the bowl portion of the sternum bone to separate from the breast meat. 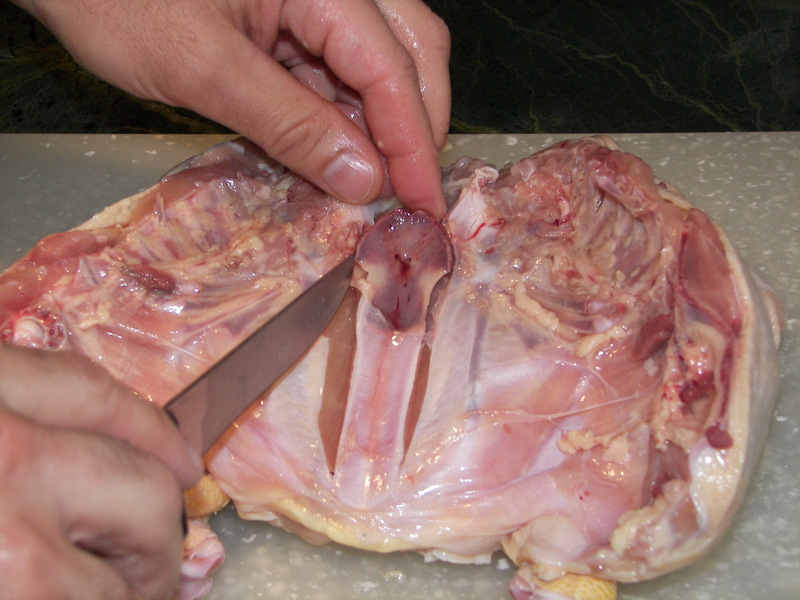 Gently cut the membrane that secures the rest of the sternum to both sides of the chicken. Continue cutting down each side until most of the white, rubber-looking portion is visible. Very gently cut the sternum bone free, being careful not to cut the chicken in half. Discard the sternum bone. The bird is now fully split open and can be laid flat on the grill or in the pan. As always, any time handling raw poultry make sure to wash your hands and clean all surfaces and utensils thoroughly with soap and hot water before using the food preparation area for anything else. Excellent instructions and photo-illustrations! This is how I have been cutting, except I leave the breast bone in. Next time I will cut out the breast bone per your instruction. Thank you! 🙂 Fae. Great blog! one of the best I’ve seen so far!